PRESS RELEASE: Universal Audio, a leading manufacturer of high-quality audio recording hardware and developer of the award-winning UAD Powered Plug-Ins Platform, today announced a significant update to its popular UAD-2 DSP Accelerator Packages. All UAD-2 SOLO, DUO and QUAD DSP Accelerator Packages now feature smaller, "greener" packaging, and include the new "Analog Classics" Software Bundle at no additional cost - the perfect way to inject the true sound of analog gear into the digital domain. 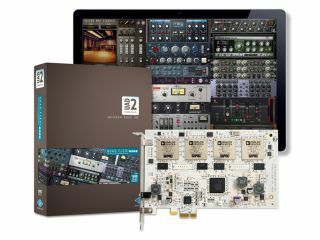 UAD-2 DSP Accelerator Packages are instant sonic upgrades for Pro Tools, Logic, Cubase, Nuendo or Digital Performer, providing rich, analog sound quality that would be difficult or impossible to achieve with a native Mac- or PC-based system. More notably, they grant users access to the entire catalog of UAD Powered Plug-Ins (sold separately) - including favorites from Manley®, Roland®, BOSS®, Empirical Labs®, EMT®, Fairchild®, Harrison®, Helios®, Little Labs®, Pultec®, SPL®, Trident®, Teletronix® and more. • LA-2A Classic Audio Leveler - Previously only available for purchase online, this plug-in is the world's most accurate emulation of UA's revered, electro-optical, analog compressor. • 1176LN Classic Limiting Amplifier - Also previously only available for purchase online, this plug-in is the world's most accurate emulation of UA's legendary, FET-based, hardware classic. • 1176SE Limiting Amplifier - A DSP-optimized version of the 1176LN, yielding higher instance counts and its own unique characteristics. • Pultec EQP-1A EQ — Another spot-on emulation of classic analog gear. Pultec EQ's have been studio staples for decades and this plug-in proves equally indispensible. • RealVerb Pro Room Modeler - The RealVerb Pro has often been hailed as the most flexible and natural sounding reverb plug-in in the industry.